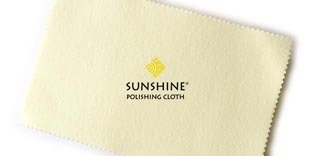 The original YELLOW Sunshine(R) polishing cloth safely cleans and polishes jewelry, gold, silver, brass, copper, mirrors and most other metals, leaving a deep, long-lasting luster. Directions: Rub surface to be polished with medium pressure. Special polishing and cleansing action of works until the cloth is completely darkened. Do not wash the cloth. 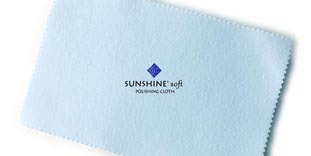 The BLUE Sunshine(R) soft polishing cloth is less abrasive than the original yellow cloth. The BLUE Sunshine(R) soft safely cleans and polishes jewelry, gold, silver, brass, copper, glass, mirrors, and most other metals, leaving a deep, long-lasting luster. Directions: Rub surface to be polished with medium pressure. Special polishing and cleansing action works until the cloth is completely darkened. Do not wash the cloth. 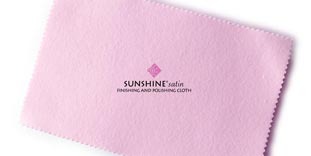 The Pink Sunshine(R) satin finished and polishing cloth is a double-action cloth. It has two different abrasive sides. The sand paper side adds a fine satin finish to metal; the polishing cloth side cleans and puts a high shine on finished jewelry, gold, silver, brass, copper, and most other metals leaving a deep, long-lasting luster. Directions: To apply a fine satin: Using medium pressure, rub your jewelry surface with the abrasive dark pink side of the cloth until a find satin effect emerges. Directions: To clean and polish: Using medium pressure, rub your jewelry surface with the polishing light pink side of the cloth. Special satin finish and polishing actions on each side will work until that side is completely darkened. Do not wash the cloth. Please note: This cloth has two different abrasive sides; one is a sand paper that leaves a fine satin finish, the other side is a polishing cloth. Do you print logos on the polishing cloths? No. All of our products are listed online. We do NOT have the ability to put your logo ON the polishing cloth. We can provide you with a polishing cloth the size of a business card, in a clear plastic baggie that YOU can insert your business card inside for promotional purposes. No. We only sell the sizes listed and the sizes are approximate. We do not have larger sizes. We do not cut custom sizes. Can I wash the cloths? No. Each cloth is impregnated with special chemical cleansing agents and either scratching (pink) or non-scratching (blue) micro-abrasives. If you wash it, you may wash off those cleansing agents and micro-abrasives. Will your products remove scratches? No. These are hand-held cloths. They do not removed scratches. If you are using the yellow or blue polishing cloths on sterling silver, for example, and there is tarnish INSIDE the scratch, it will remove the tarnish so the scratch will be less visible. If you are using the pink cloths, one side WILL CREATE scratches to produce the "satin" finish (the other side of the pink cloth is to polish). I don't have a Paypal account. How do I order? You do not need a Paypal account to place your order online. On our secure checkout page you can choose "other" or "use any credit card" and you can place your order using any major credit card. We use Paypal to process our credit card orders because it is the least expensive way to process your online orders. We pass that savings on to you. You do NOT need a Paypal account to place your order. Defective materials will be replaced immediately. Please notify us of defects as soon as product arrives or within 3 business days. If not completely satisfied with any item within 10 days, return it in resalable condition for a refund, less shipping and a 10% re-stocking charge. Thanks for allowing us to serve you! Yes, if you order online with a product total of over $50, you get free shipping within the United States. If your order is under $50 or we are shipping product outside of the country and you want an exact shipping cost , please place the items you are considering into your cart and enter your shipping zip code. Which cloth is best for sterling silver beads with a coatings? If a coating is put on sterling it is probably to prevent the sterling from tarnishing. If you rub to hard, with anything, you could rub off the coating and then the piece will start to tarnish. The coating is probably there prevent chemicals (air, lotions etc) from getting to the sterling and thus tarnishing. The blue cloth is the softest cloth we sell. If the piece is already starting to tarnish the coating has begun to deteriorate already and you will run the risk of removing the rest of the coating rubbing it with anything. Click here for information on the HMIS rating.